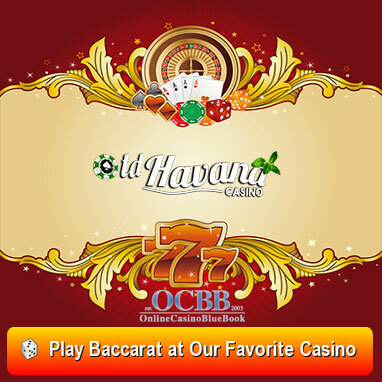 Baccarat is a casino card game that can be enjoyed by players at online and land-based casinos. The game has numerous variations, but there are 3 primary versions that are widely enjoyed: North American Baccarat, also known as Punto Banco, Chemin de Fer & Baccarat Banquet, which is also known as à deux tableaux Baccarat. Punto Banco, which translates to Player Banker, is a pure game of chance and luck. This game does not involve any decisions or skills. The outcome of the game purely depends on the cards that the player and the banker get. On the flip side, the other two versions, Baccarat Banquet & Chemin de Fer involve skill and players make decisions that will affect the gameplay. The primary concept of Baccarat depends on comparing between the two hands. One hand belongs to the player while the other belongs to the dealer (banker). Each round will have one of three possible results: either the player’s hand will win, the dealer’s hand will win, or the round can end in a tie. The rules and the card value are different from other card games. The gaming procedure and dealing order differ from one Baccarat version to another. In this tutorial, we are going to discuss the history of the game, the gaming procedure and the rules of the game. If you are looking for the perfect Baccarat tutorial, you have come to the right place. Baccarat is one of the oldest card games from Europe. Due to a lack of documentation, it is possible that the true origins will never be known. ( http://gaming.unlv.edu/papers/cgr_op03_whiting.pdf ) Some theorize that it has Italian origins and others believe it may have origins in France. One thing for sure is that Baccarat is one of the oldest casino games in the history of gambling. The game is named Baccarat because one of the main game rules is that all ten-value cards — including tens, queens, kings and jacks all have a value of 0. It is also used to describe a hand that has a total of 10. For instance, if a hand has a 7 and a 3, the total is 10 which is equal to 0. Thus the hand is called Baccarat. The game was documented for the first time in the 1400s in Italy and then spread to France. Although the game debuted in 1400, it took more than five-hundred years to become mainstream and become a premier casino game in Europe. Baccarat was a popular gambling game among the royalty class in France and there was more than one version of the game. In the rest of Europe, Chemin de Fer was the most popular, while Punto Banco was the most commonly played version in England. Interestingly, the baccarat version that made its way through South America to the United States was the English version of the game. Over the course of time, only three main versions remained popular: Punto Banco, Chemin de Fer and Baccarat Banquet. 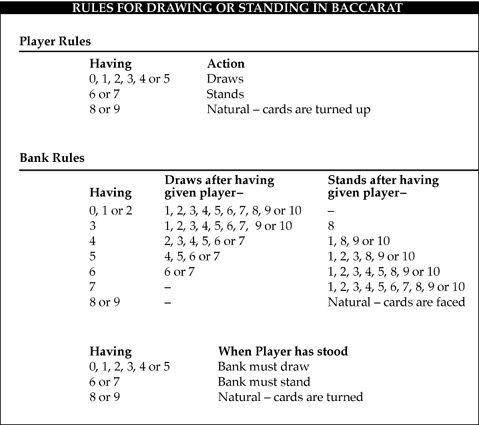 The three Baccarat games follow the same guidelines and basic rules, but they differ in the gaming procedure and the dealing order of the cards. The most commonly played Baccarat version in the United States is Punto Banco, also called Mini Baccarat. When all of the cards are dealt players will only bet on one of the 3 possible outcomes. In US casinos, players will find mini baccarat tables all over the casino. Mini baccarat has lower betting limits so they are often found at the regular casino floors. Of course, with the development of online gambling, Baccarat became one of the greatest online casino games available. Whether players live in the United States or Europe, they will be able to find any version of Baccarat at their favorite casino. Due to its popularity, the game is one of the few that can be found at the Live Casino section of online casinos. 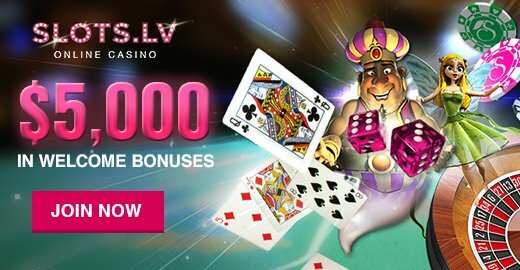 Live Casino Baccarat lets players interact with a live dealer and other players during the game play, which adds to the fun and the excitement of the online Baccarat experience. In this section, we are going to discuss the gaming procedure of the most popular Baccarat version, which is also the original baccarat version that came from France, Chemin de Fer. There are six decks in play in this game and they are all shuffled together. Players are seated around an oval-shaped table and any discarded cards will go to the middle of the table. The game starts with the player to the right side of the dealer and takes a counterclockwise direction from there. One of the seated players will become the banker and he is going to deal the cards while the other players will become the bettors. The banker’s position is passed in the same direction of the play. The banker will also place a bet and the punters will see if they want to match the wager of the banker. One of the players will go bank, which means that he will match the wager. If no one chooses to go bank, the player who has placed the highest individual wager will be the one who will speak for the punters. If the total bets do not match the wager of the banker, other punters who are observing the game will be permitted to place wagers so the total bet can match the banker’s bet. The banker will then deal two cards to the players and 2 cards to himself. The banker and the player who represents the punters will check and view the cards. If any of the hands have a total of 8 or a 9, they must say so. When they do, the hands will be revealed and a comparison will take place. The hand that has the highest total will win. 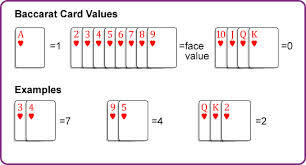 On the other hand, if none of the hands are equal to 8 or 9, the player will decide if he wants a third card. If he accepts the third card, it will be dealt facing up for everyone to see. 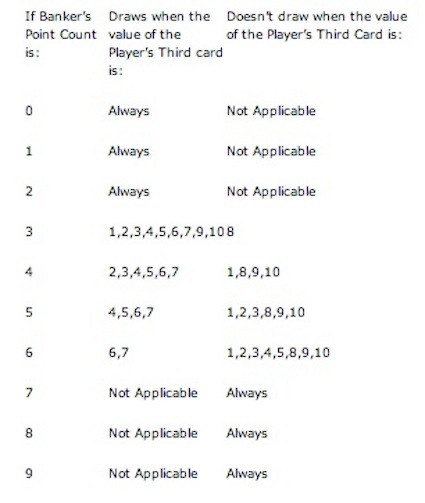 Of course, mathematically, players are advised to ask for 1 more card if they have a hand total between zero and four. They should not ask for another card if the hand total is equal to six or seven. 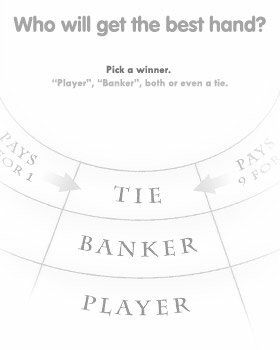 After the player makes his choice regarding the 3rd card, the banker will have his turn to make the same decision. After both the player and the banker make up their minds, all of the cards will be turned face up and the hand that has the highest total will be declared the winning hand. If the player’s hand wins, punters will get their wagers back plus their winnings and the position of the banker will be passed to the next player. If the banker wins, he or she will continue being the banker and players will lose all of their bets and another round will begin. Baccarat is considered a “Single Play” game. This means that players will only make one move for each hand, unlike other card games such a Blackjack where players will keep making decisions during gameplay. In Baccarat, players will simply choose one of the 3 available bets and will bet on the banker, the player or a tie; the cards will then be dealt according to a set of rules. Although the 3 different versions of the game have slightly different rules, they all have the same basic guidelines and rules that we are going to discuss in this section. If the 2 cards forming the hand are 7 and 2, the total is nine; if the 2 cards are a 7 and a 3, then the total is zero; and if 2 cards are 7 and 4, then the total is 1. The game begins as the dealer deals 2 cards to the player’s hand and 2 cards to the banker’s hand. It is important to note that the player’s hand is not yours; it is a hand that will be dealt to the square on the table that says “Players.” No matter how many players are seated at the Baccarat table, there is only one “Player” hand dealt on the table. When the two hands are dealt, the comparison will take place — the gaming procedure depends on the hand total of the two hands. If any of the two hands has a hand total of 8 or a 9, the round ends and the winning hand will be paid off. In that case, the hand that has the hand total of a 9 will beat the other hand that has any other total. If none of the hands has a natural hand (hand total of 8 or 9), then more cards will be dealt. These cards are dealt according to the rules and not the decision of each player. According to these rules, the player’s hand will get the card first. If the hand total is equal 0, 1, 2, 3, 5 or 5, another card will be dealt. On the other hand, if the hand total is equal 6 or 7, the hand will stand. If the hand total is 3 and the player has a hand total between 0 and 7, then the banker will draw. If the banker has a hand total of 4 and the player has a hand total of 0 or from 2 to seven, then the banker will draw. If the dealer has a total of 6, he will get a card if the player has a total of 6 or 7. Baccarat is a casino card game that offers its players relatively good odds because the game is quite simple and fair as players will only have three wagering options and each hand is played depending on a fixed set of rules. The rules of Baccarat were carefully constructed in order to create a small but a measurable advantage for the house for the two bets, the player, and the banker while creating a huge advantage for the house in the tie bet. According to complex studies and calculations, it is estimated the banker hand will win approximately 50.68 percent of the times of all of the hands that do not end in a tie and that the player bet will win 49.32 percent of the time. For example, players who place 100 credits worth of wagers on the player hand will expect to lose 50.68 of these credits while winning 49.32. The exact difference between the two is equal to 1.36 percent, which means the house has a 1.36 percent edge against the player’s wager. If the banker bet does not offer any house advantage, and if it wins more than 50% of the time, why do casinos offer this game? The fact is, casinos know this and charge a 5% commission on any winnings from the banker bets, thus making up for the advantage. The betting odds for the banker bets can be calculated like this: If baccarat players wager 100 credits, taking into consideration the five percent commission, players are going to win 0.95 of every 1 credit they wager. If they are expected to win 50.68 percent of the time (multiply 0.95 by 50.68), it means that players will get 48.15. Players are still expected to lose 49.32, so the difference is equal to 1.17 which means that the house has a 1.17 percent advantage. A tie will occur almost 9.55 percent of the time in any game of baccarat, which means the real odds of this bet are 9.47 to 1. Dividing 9.55 into one-hundred results in 10.47 while taking into consideration that players will get their original bet back. So instead of winning 10.47, players will wind up with only nine. If we divide the difference, 1.47, into 10.47, it shows that the house has an advantage that is equal 14.4 percent. Although a lot of players might be tempted by the eight to one payout that the tie bet offers, it is unfavorable if it is compared to the player and the banker bets. After all is said and done, it is obvious the best logical bet according to the given odds is the banker bet. Even after deducting the five percent commission, the banker bet still has the most favorable odds that a game of baccarat can offer. Baccarat is, after all, a card game, so luck has a lot to do with the outcome of the game. There are strategies, tips, and advice but none of them will guarantee players that they will win. This does not mean that the tips and strategies are not useful, but it means that since it is a card game, they are not 100% guaranteed. One of the simplest tips is always to put your money on the banker. This is because the house advantage on the banker bet is lower than the other two available bets. Even after calculating the commission out of the winnings, betting on the banker is still the better choice. You have to be noted that such strategy is only fruitful in the long term and not the short term. As after a large number of hands, mathematically, the banker wager will come out on top. Many players tend to record the outcome of each hand while they are at the Baccarat table to see which hand wins more. This can be quite useful as it gives you an idea on the hand that the shoe usually prefers but once again, it is not a guarantee. 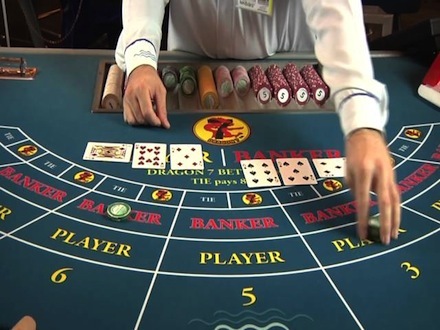 It resembles keeping track of the roulette table outcome; it will help you decide on the numbers but it can never guarantee a win, and this is the case with Baccarat. Players will find a lot of Baccarat systems online. These systems guarantee players that they will win, which is a flat out lie and a scam. This is because there is no possible way that any system will guarantee you a win. The only people making money out of these systems are the people who are selling them. One of the most common betting systems is the -/+ progression betting system. Theoretically, this system is a good idea. According to this system, you will bet one unit on one of the hands. If you lose, bet two units on the same hand and so on. This is because, in the long term, you should win sooner or later by placing bets on the same hand and when you win; you will make up for your losses because you kept doubling the bet. This only succeeds in theory because you can hit the limit of the table, and you can run out of money before winning. The last tip is related to the tie wager. It is a very tempting choice to bet on the tie wager because of its pretty generous payout. The reason behind that is not the generously of the casinos but the fact that it has the highest house advantage, not only in baccarat but all casino games. The house advantage is equal 15%. This is why it is recommended to stay away from it since the other two bets, the player, and the banker bets have a house advantage of 1% only. Baccarat has one of the lowest house edges among casino games. 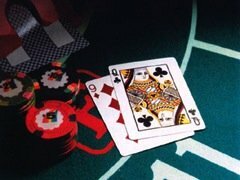 Craps players who can afford to take odds with their pass, come, don’t pass or don’t come bets get a better deal, and so do blackjack players who learn basic strategy. But depending on table minimum bets, craps with odds usually requires a bigger bankroll than baccarat, and blackjack players who don’t put in the study and practice time to master basic strategy face a higher house edge than baccarat players do. Although the odds change very slightly as each card is dealt and removed from the remaining deck, you can’t effectively count cards in baccarat. 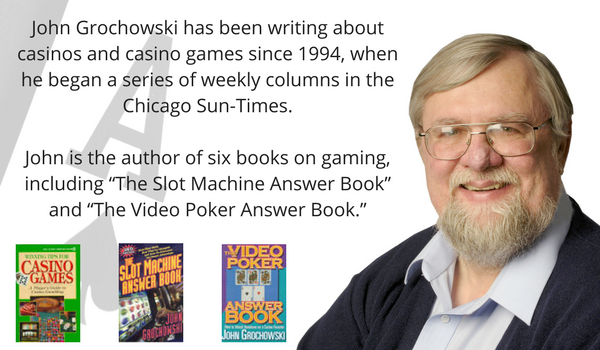 The late Peter Griffin, mathematician, and author of “The Theory of Blackjack,” calculated in a typical eight-deck game in a live casino, a card counter who doesn’t bet unless the count gives him an edge can squeeze out an edge of 0.7 percent. However, the counter would be betting on only about three hands every eight hours. That’s quite the waiting game. No player is likely to have that kind of patience, and the casino may refuse a seat to someone who goes hours at a time without making a bet. Because the change in odds as cards are dealt is so minuscule, the probabilities are essentially the same on every hand. That means it’s futile to play systems such as betting ties after 10 or more hands without a tie. Players have tried such systems often in the past, but even if it’s been that long since the last time, there’s still only a 9.55 percent chance of the next hand ending in a tie. The tie bet is an underdog on every hand, and the 14.4 percent house edge is too large to overcome. You’ll get the lowest house edge by always betting on the banker, but the difference between the 1.17 percent edge on banker and 1.36 percent on the player is small enough that it’s relatively low-cost fun to change up your bets. Many baccarat players like to ride streaks. A ride the streaks player waits until one side has won twice in a row, then starts betting on that side. When that side loses, he either switches sides or sits out until there’s another streak of two in a row, then climbs on. The house edges remain the same. The attraction is that there can be spectacular wins when the game goes streaky. In the long run, the good times are offset by more frequent small losses when the table is choppy, and the starting points of two-win streaks are ended immediately by third-hand losses. In live casinos, big baccarat tables usually have higher minimum bets, but mini-baccarat tables are much faster with more hands per hour. If your bet would be close to the same size at either table, big baccarat is easier on your bankroll because of its slower pace. The big/mini speed differential isn’t a consideration online.